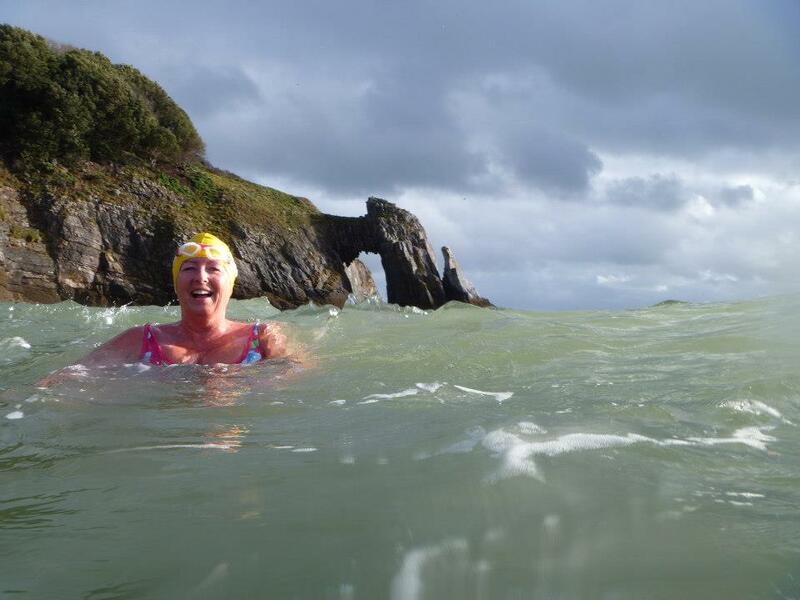 The Cold Water Swimming Championships encapsulate all the wonderful things about outdoor swimming: lovely people, lots of laughs, and an admirable amount of grit. Not to mention a love of dressing up. The event is held every two years at Tooting Bec Lido in London. There was a large Devon contingent, with a relay team competing as a collective Cream Tea, and our friends the Scottish Lassies as I call them, were also there. It was also great to meet the lovely Mr and Mrs Aquatic Ape; the sun shone and the atmosphere was very warm despite the icy water - it was about 1 degree. Imaginations ran riot with the hats for the head-up breastroke competition. Rosie, from the Devon contingent, sprouted an amazing lighthouse - Smeaton's Tower in Plymouth - which even, correctly, had a flashing light; Mrs Ape was a beautiful white swan and Pauline, another Devonian, was a jolly duck. At the, ahem, other end of the scale, we had a man attired in a Union Jack mankini. There was an interesting reaction when he got in the hot tub. It was organised chaos as the hundreds of competitors took part in their heats; some serious, others much less so. In the final event, the Endurance swim, the atmosphere grew more sober, as swimmers did the equivalent of 5 lengths in the freezing water. 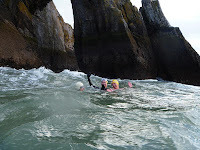 Bugle Hole, a keyhole-shaped cove near Plymouth, is one of my most favourite places to swim. It is an inlet in a dramatic series of rocks that fills up completely at high tide, making a natural swimming pool. We set off on a freezing cold day. It was dry, although somewhat overcast; at the pool the dark clouds emphasised the dark greys and purples of the rocks. We plunged in and frolicked around before swimming out of the 'neck'of the keyhole into the ocean beyond. At this point the sun came out and drenched us in light - so wonderful, and the water glowed a beautiful green too. We enjoyed ourselves so much we stayed in far too long and got a little too cold. However my new post-swim tipple - spiced rum - did the trick warming us up. Exhilarating! We'd planned to swim at London Bridge, a natural rock arch in Torquay, on a very low tide, to be able to explore the caves hidden within its depths, and also to get to see such lovelies as Dead Men's Fingers, Elephant Hide Sponge and the like. Unfortunately swelling seas, dancing waves (to put it nicely) and murky water put paid to that idea, but we still swam out to the arch, avoiding the seal that was hanging around closer inshore, sheltering from bad weather. It was actually a very beautiful and dramatic swim, as the sun kept popping out from behind the dark, glowering clouds, and we got carried up and down in the surges, with the stark outline of the arch ahead. As we approached, we could see the sea foaming furiously through the gap, and decided not to go under the Bridge. Thanks to Allan Macfadyen for the pictures. The great advantage of a drysuit is that you can wear your thermal longjohns while you go swimming. Some might argue, why would you want to, but Amanda would not be in their camp. She has a mission to be warm at all times. We decided to test out her drysuit at Elberry Cove, where the water was an exotic emerald colour - just the sensory boost we needed in the dullness of winter. We couldn't wait to get in, but were held up by the process of getting her into the suit. We both got into a muck sweat wrestling with it, and had to cut the neck to get her head through. Once in the water, she floated around like the Michelin Man, and perfected a sort of aquatic waddling stroke, before working out how to let some of the air out. We have a tradition (well this is the fourth year we've done it so I think it counts as a tradition) of bringing in the New Year with a swim at Hope Cove. This year it was with a little extra panache, as Esther decided to bring along her wind up gramophone, so we entered the water to the strains of the Pomp and Circumstance March. The plan was to swim from Outer to Inner Hope, around the Shippen, a small headland (so called because of all the ships that have fallen foul of it). There were huge waves, murky water and lots of rocks, so most of us decided to turn back and swim in the calmer waters of Inner Hope. We watched and waited for the few who had decided to go ahead. We got a bit confused as it looked as though there was an extra swimmer coming in, but it turned out to be the Hope Cove Seal.